Cone beam computed tomography is fast becoming the choice for both diagnosis and treatment planning. In many instances, CBCT soon will become the standard of care. From the specialist to the general dentist, cone beam computed tomography is fast becoming the choice for both diagnosis and treatment planning. In many instances, CBCT soon will become the standard of care. During the webinar, we will introduce attendees to Cone Beam Technology in general with comparisons of all current available CBCT units. We will show a live scan from scanning to processing until images are available to work with. The objective is to learn to use cone beam tecnology for general dentistry, Endodontics, Implantology, Oral Surgery, Orthodontics, Oral-Maxillofacial-Surgery and Periodontics and show the ease of use of this technology. The tremendous speed of processing and real time visualization of cone beam units these days give the doctor more time for diagnosis and treatment planning. providing an interactive learning experience that allows the participant to get familiar with CBCT technology and the unlimited possibilities of software manipulation to provide the best diagnostic value to the patient and confidence for the surgeon or dentist. “The Power of Cone Beam Technology” is co-sponsored by Tribune Group GmbH. Tribune Group GmbH is a recognized ADA CERP and AGD PACE provider. Dr. Daniel McEowen is a 1982 graduate of Loma Linda School of Dentistry and has been in private practice for 26 years. 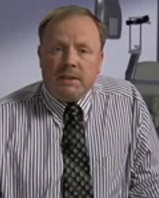 He is a founding member of the WCLI (World Clinical Laser Institute) and has been active in FDA approval of oral surgery techniques using erbium lasers. Dr. McEowen has been involved in Cone Beam technology for more than five years and owns 3-D Imaging Center in Maryland. He lectures throughout the United States on the incorporation of Cone Beam in the general dentist office and is an advanced trainer for PreXion 3-D Cone Beam systems. Dr. McEowen is in active practice in Hagerstown, Md., in a multidiscipline practice where he incorporates many new technologies into his practice.